Michael Marino of Friends of Corlears Hook Park has posted a petition in support of a resolution to have the Department of Transportation look for ways to increase the safety of pedestrians crossing Cherry Street to use Corlears Hook or East River Parks. 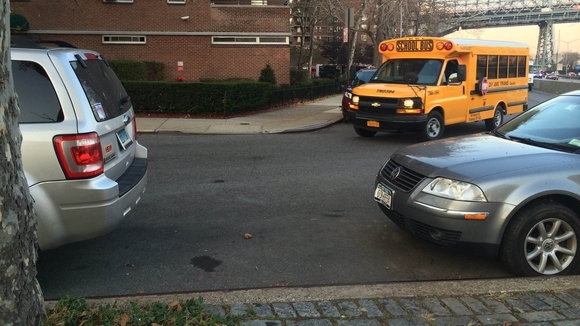 Crossing Cherry Street is problematic for several reasons: there’s no stop sign for cars turning from the FDR Drive access road and there is very little visibility around the corner and around cars that are parked in no-parking spaces. A stop sign, a crosswalk, a speed hump, parking enforcement — any one of these could make a huge difference. Please add your name to the petition. The resolution has been approved by the CB3 traffic committee, and will be voted on by the full board on January 29. The resolution does not specify any one remedy, but asks the DOT to investigate the area and take appropriate action. Your voice will go a long way to move this issue forward.